Last year we tested out this event, and we walked away with a list of how we wanted to change it to make it better, where we knew we had to hold the hotels up to a higher level and we knew what we wanted our fabulous team to bring to the table. parking- well Saskatoon ultimately was uggh for parking. But what we learned is this. Saskatoon has the cheapest parking rates in all of Canada. yes that isn't comforting but it is something. Did we like that the Sheraton didn't have spots for us that we paid for? nope, so how are we going to make it better? We have a handful that have been with us this year. We have been blessed. Super thanks to everyone! For a complete list of teachers and more about them and which cities they taught in click here. Thanks to Jen Walker for everything amazing she does behind the scenes. We are also very proud of our CLASSES! BoBunny Trinkets & Bobbles & Bling, Oh My! Let's get inky! This class will have you inspired to pull out your favorite stamp sets. We'll play together and work through Kelly Purkey's favorite stamping tricks using Studio Calico and Hero Arts stamps. From heat embossing to stamping with mist, this technique heavy class is also heavy on fun. Together we'll create cards and tags to show off your finest stamping skills. Join our resident patterned paper expert AND self-proclaimed sketchaholic, Kelly Goree, as she shows you just how easy it can be to rock a scrapbook sketch and create fabulous pages as a result! You’ll never have another excuse for running out of scrappy ideas once you learn her fun tips and techniques for taking one amazing sketch and streeetttching it three different and unique ways! In this class you will create one double-page and two single-page layouts all from the same fantastic PageMaps sketch designed just for this Crop & Create class! Complete colour instructions along with two bonus PageMap sketches for you to practice your new skills on will be included! Want to learn the latest in how to use Maya Road products to create your own little catalog if fun flowers? We will do it Maya Road style with Caroline Lau. Caroline will walk you through up to 10 different ways to use Maya Road products to create your own flowers and coordinating bits and pieces. You will go home with a Maya Road Acrylic Stand of finished flowers you can refer to over and over for cards, layouts and more! Learn to use zipper trim, wooden products, stamps, chipboard, kraft and more to create something uniquely your own. Have you ever wanted to create home decor? This is the perfect way to show off your style while experimenting with different techniques. This class will provide a great opportunity for you to learn about paper collage, layering, and then how to create different unique looks with paint, stamps, ink, doodling and rub ons. Of course there will be bling! This is the perfect mixed media class that will suit all skill levels. Easy paced, and lots of room for you to be creative and experiment! Part 2 Duration: 1 hr. Special occasions always seems to sneak up on us, leaving everything to the last minute! Isn’t it nice to have a handmade card ready to go right when you need it? Join BoBunny to plan ahead and create cards perfect for each season and occasion. Learn to make the most of great card sketches by utilizing them in different ways to create cards with their own unique style. In this class, you’ll play with BoBunny Double Dot papers and BRAND NEW BoBunny collections to make eight gorgeous cards. Whether you joined her for the first round of the popular Designer’s Dozen workshop or this is your first very experience, you absolutely MUST attend this ALL NEW workshop! There will be plenty of new material, fabulous product and of course twelve more tips and tricks in this ALL NEW2.0 version when you join Kelly Goree for a fabulous "scrapbooking baker's dozen!" We all hunt for those cherished tried-and-true recipes that not only make our lives easier but make us look like we’re Martha Stewart to boot! It’s those favourite go-to basics that save us time and stress in the kitchen and it’s no different when it comes to our scrapbook pages! Well known for her bold use of color, pattern and design, Kelly will teach you how to follow the recipes that will take your layouts from tasty to extra-yummy in no time. In this class you will create three single-page, design-packed layouts that you will love as well as receiving the class lecture material with your instructions for easy future reference! Are you a whiz with paper, but struggle to make the finishing touches come together? Join BoBunny to discover one of the funnest parts of scrapbooking…embellishing! Learn the basics of creating embellishment “clusters”, to balance your pages and add dimension. Before you know it, you’ll be an expert “cluster-er” as you bring your layouts to life with layering and details! You’ll go home with two double-page layouts full of BRAND NEW Bo Bunny product! Have you always wanted to learn some simple tricks, tips and techniques to use when creating a Mini Album? Let Caroline Lau, owner of Maya Road, share some of her best secrets as you work on a beautiful mini album! 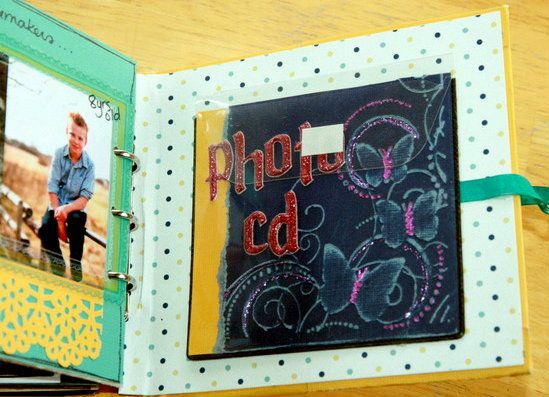 From photo sizes to photo editing to embellishment, simple tricks can make mini albums a breeze. Learn to use trims, pins, chipboard, glitter, Maya Mists, wood and more. Create a fabulous cover, learn how to decorate the inside and then bring home your album to fill with your favourite photos! Misting is a hot new trend right now and a must-have in your supply stash! Kelly Purkey will guide you through putting together a beautiful mini album using fresh and fun misting techniques. You'll see how to stretch your supplies with the help of mist to create background, accents, and titles. New to misting? Here's your opportunity to jump right in and learn the secrets to misting up a storm like a pro. 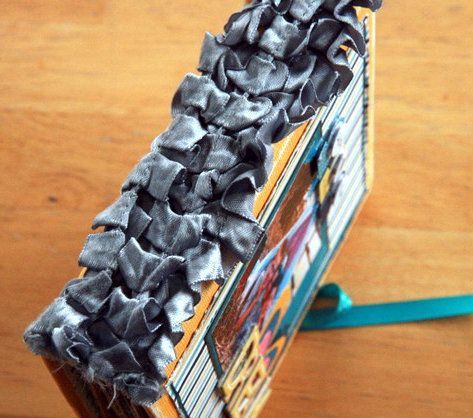 Do you love the DIY embellishments you see on Pinterest and wonder how to make them? Then this is the class for you! In this fast paced class we'll create a variety of embellishments using products from your favorite manufacturers as well as items you might have laying around your house. Every student will receive Xyron product and lots of extra supplies to create additional embellishments on your own. Can't wait to see what you'll create! A few things we haven't changed about our event---FABULOUS make n takes. Our goal is to provide a cute, fast & fun projects that you can use. They usually show a great idea, or a technique, something to inspire you. Of course these & all our classes could not be possible without our amazing manufacturer support. At Scrapbook & Cards Today, we are very lucky to have amazing sponsors! When we shared with them, the Crop & Create concept, they jumped at the chance to be a part of these events! ok, I've talked forever and ever. But the reality is we have 21 spots available. We'd LOVE to have you! If it interests you, click here to sign up! ok, I will leave you with that fun thought. I am on a high right now. While I was creating this post, I just found out fabulous girls I adore are flying in from New Brunswick to join in on their THIRD Crop & Create with us. They attended Moncton and then Ottawa last weekend and can't get enoughso they are coming to Saskatoon. So I am tickled pink. It is such a fun time to hang with your girls. I will probably keep talking about some of the amazing things we have taking place in 5 weeks, such as a BRAND new make n take that is gonna blow your minds! cannot wait! what a great picture and thought! Well you know my passion for mini albums. Just cannot stop making them. I find that I make one for every "major occasion". photoshoots, camping trips, summer faves, holidays, etc. that way, the kids can look over and over at their pics, I don't worry about them wrecking these books because I don't create these for a lifetime, those are the layouts in the albums that I want them to take with them. The albums are for our pure enjoyment now. 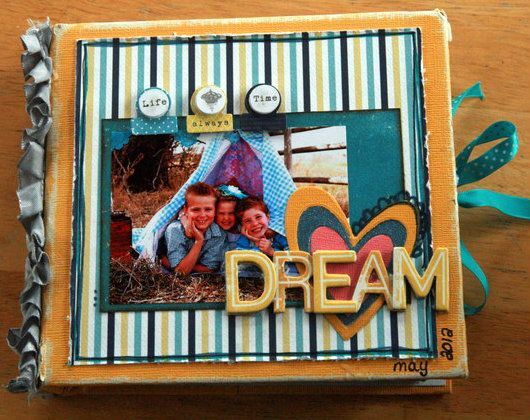 I love to make my albums out of chipboard or acrylic. Fave bases ever! I enjoy tackling making an album on burlap, canvas and other materials, it just requires more thought on how to adhere things. This album is bright and fun! I sanded almost all the edges to give the album a "framed in" look. fun right? It gives it a different look. Don't forget to include a spot for the CD. I used the Scrapbook Adhesives by 3L CD pockets. They ROCK!!!!! I put them everywhere! I like to decorate a paper and I slide it in. I put the CD between the paper and the back, then it still has the protective paper in there.